A perfect blend of yesterday and today. Located in the coveted Uplands area. 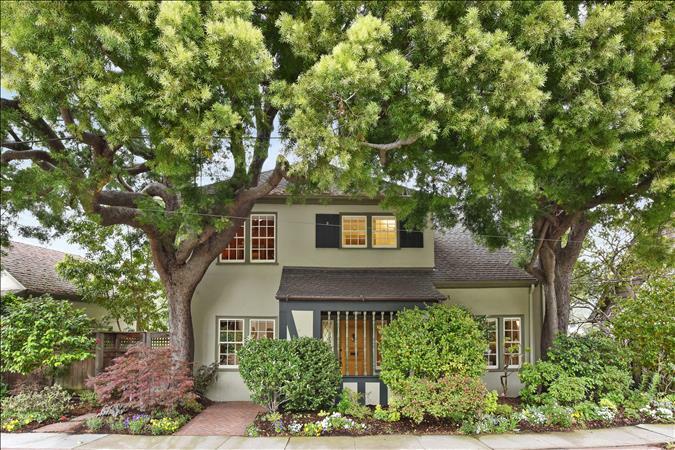 Built around 1912, the well thought out floor plan offers 5 bedrooms, (4 on the upper level including the master suite with views of the Claremont hills), 2 full baths and 2 half baths. The entry hall leads to a welcoming living room with wainscoting, cove ceiling, a wood burning fireplace. Continue on to the very large dining room with box beam ceiling and custom furniture made especially for this special room. Love to cook and entertain? The spacious eat-in kitchen offers a 6 burner gas stove, 2 ovens, and counter space and storage galore! Truly the hub of the home. French doors open to a private deck – a perfect spot to enjoy your morning coffee or evening cocktail after a busy day. The main level also includes a den and half bath. The multi-purpose lower level offers a huge bonus room level out to a secluded patio, the 5th bedroom and half bath. What a great office, playroom, media room…! The excellent floor plan easily flows from indoors to outdoors for both casual living and entertaining. Gaze at the serene tree vistas from each room. There is room for everyone to enjoy the play structure, level yard, patios and deck. There is even a greenhouse for those with a “green thumb”. Well located near Star Grocery, Rockridge shops, Safeway, BART and the freeways connecting the business centers of the Bay Area. Berkeley mailing address. This home is in the City of Oakland. See list of seller upgrades and improvements below.